Sweet sauce, succulent pork – what a great slider this makes ! 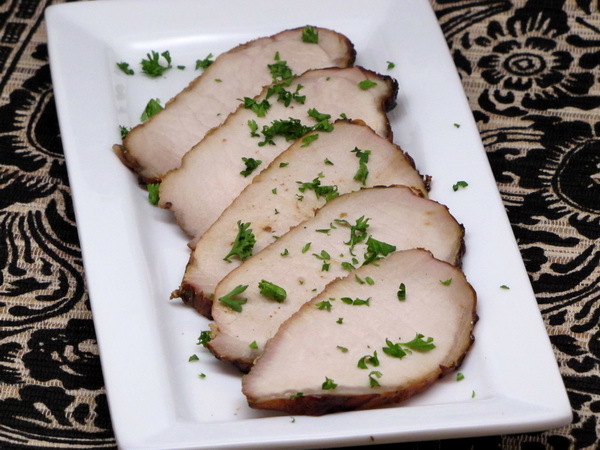 It’s easy to do the pork ahead of time and keep warm – so this is a great dish for entertaining. Heat grill. Mix sauce, rum and honey and bring to a boil down for a couple of minutes. 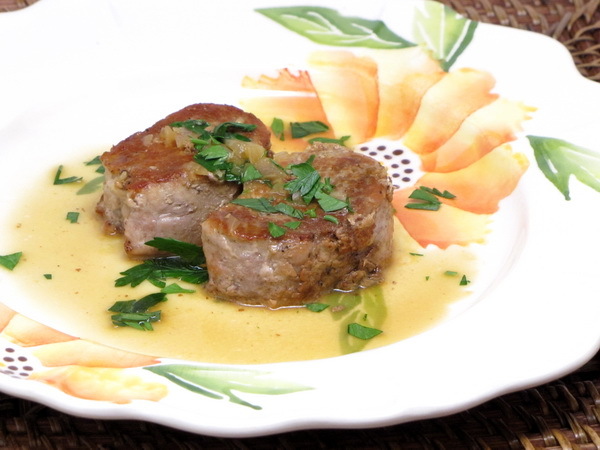 Use half of the sauce to baste the pork while you grill it 20 minutes or until done. 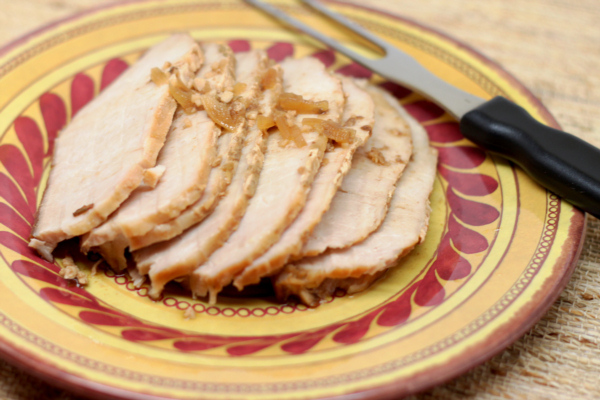 Let pork stand for 5-10 minutes and then slice thinly. Place slices on buns and add some of the reserved sauce. 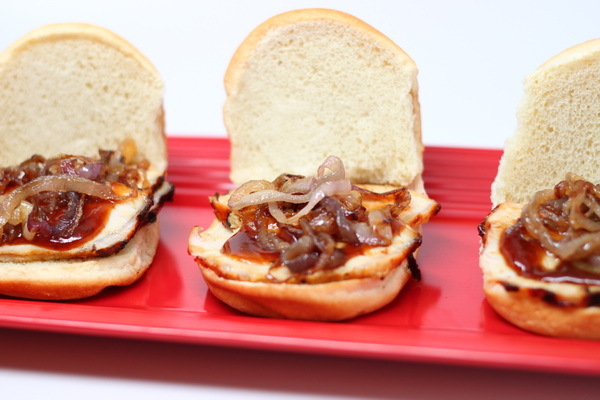 Optionally add some caramelized onions for a super savory sandwich. To caramelize onions, heat 1 T oil in a skillet and then cook onions 5 minutes on high heat. Reduce heat to medium low and continue cooking 20 minutes or until golden brown. You may need to add hot water a tablespoon at a time to keep them from drying out. When done, season with salt and pepper. Mix broth, soy, molasses and pepper. Take 2 T of the mix and stir in cornstarch and set aside. Heat 1 T oil in a non stick skillet and cook pork. Cook 5 minutes to brown it and then place in a bowl and set aside. Add 1 T oil to the skillet and cook onion 3 minutes then add the pepper and cook another 3 minutes. Add bean sprouts and ginger and cook another 3 minutes then add the broth and bring to a boil. 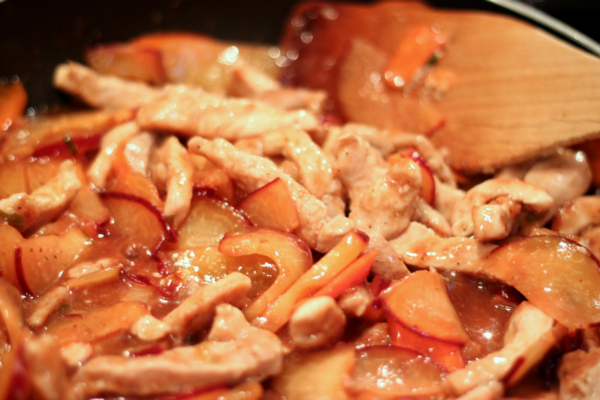 Cook 4 minutes and then add cornstarch mix and pork and cook 2-3 minutes to thicken sauce and finish up the pork. 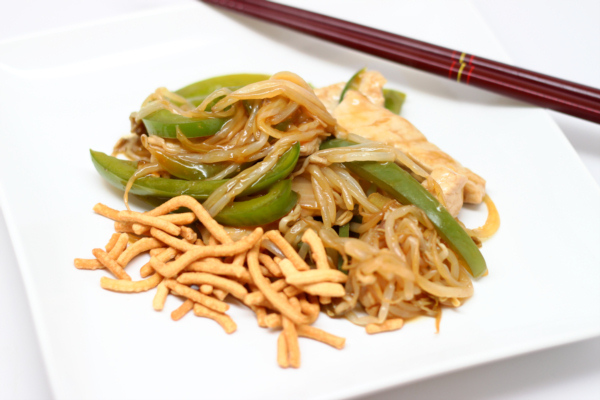 For just 130 calories, add ½ c of chow mein noodles to the side. This is a fantastic dish – the feta cheese brings a nice flavor and makes the dish much more special. It’s a great balanced meal in a bowl – all your protein, veggies and carbs all in one nice package. Rub pepper into meat and cut into bite sized pieces then cook in oil over medium heat for 10 minutes or until no longer pink. Stir in Kitchen Bouquet and stir well. Cook pasta for 9 minutes in boiling water and then stir in spinach and cook a minute longer. 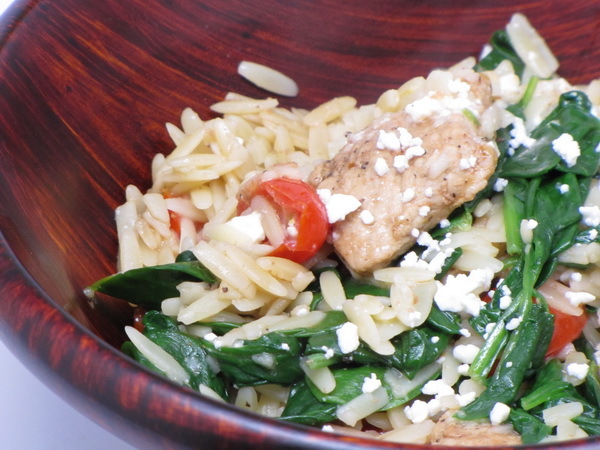 Add tomatoes to the pork and cook 1 minute then add the drained orzo and finally add the feta cheese. Just before serving, splash with some fresh lemon juice. Use tart plums if you don’t want this dish to be too sweet. Fruity yet savory and plums just go so well in fruited dishes ! Heat oil in a large skillet on medium high heat. Mix pork with 1 T cornstarch and rub it in. A good way to do this is place both in a Ziploc bag, seal and then mush it around repeatedly. Cook the meat 5 minutes and then transfer to a plate. Reduce heat to medium and cook the carrot, scallions and garlic for 1 minute and then add the plums and cook for another 5 minutes or until they start to get soft. Whisk broth, jam, vinegar, soy, ginger and the rest of the cornstarch and pour into the pan and bring to a boil and cook 1 minute then lower the heat and place the pork back in the pan and cool 3 minutes or until all is heated. This tasted equally as good all nestled inside a wrap for easy portability…what a great brown bag lunch ! Mix oil, lime, mustard, and salt in a zip loc bag and add pork. Mix up and refrigerate in the sealed bag at least 1 hour. Heat grill and cook pork 10 minutes each side or until done. 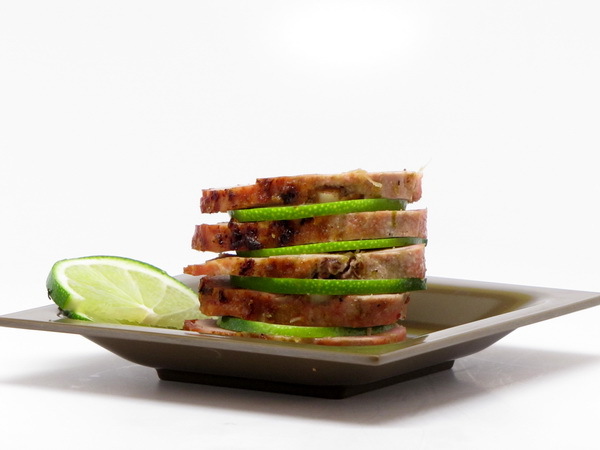 Cut diagonally into ¼ inch slices and set ½ of it aside for another meal. 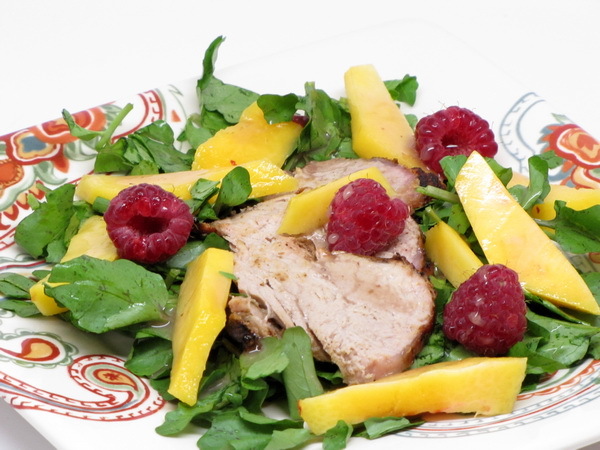 Arrange meat on watercress pieces and drizzle with vinaigrette then garnish with fruit. Adding coffee to meat marinades gives them a special depth of flavor. This one is especially tasty ! Combine first 6 ingredients in a zip loc and add pork to marinate it in the refrigerator for 8 hours to over night. Heat grill and place pork on rack coated with Pam. Grill 15-20 minutes or until done. Let sit 5 minutes and then slice thinly. If it is not grilling season, heat oven to 350 degrees and cook pork 50 minutes or until desired doneness.